3/20/2011Share this story on Facebook! You're in luck! All past episodes of To a Pulp are streaming on-demand at ICTV.org! 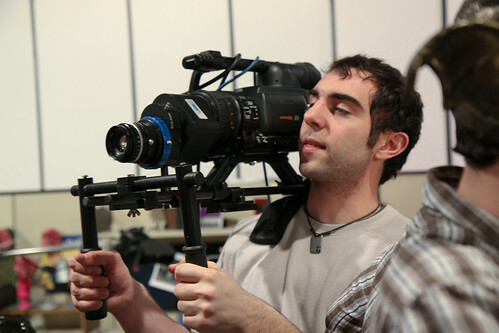 ICTV gives Ithaca College students the opportunity to create and produce completely student-run television series about whatever sparks their creativity. A group of students have taken this experience to a whole new level by not only writing and producing a television show, but building an entire set from scratch completely off campus. To A Pulp, produced by sophomores Joe Killeen and Nate Breton, started in May 2010 and is currently in its second season. Each season consists of three 30 minute episodes. 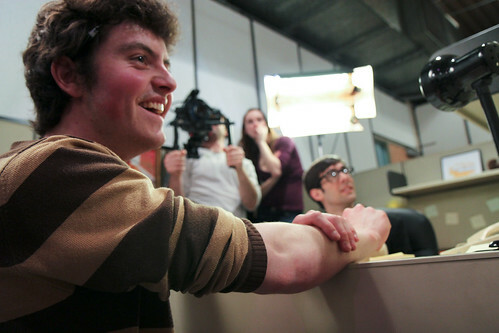 The show, partially inspired by the college’s newspaper The Ithacan, shows the comedic side of a student run newspaper. The series follows the working lives of ten Daily Pulp staffers on their quest to meet deadlines. As each episode unfolds, another ridiculous challenge presents itself. 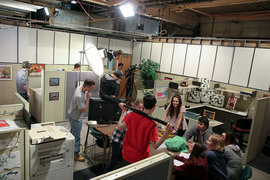 The set was built on the South Hill Business Campus, which is located directly across the street from the Ithaca College campus. 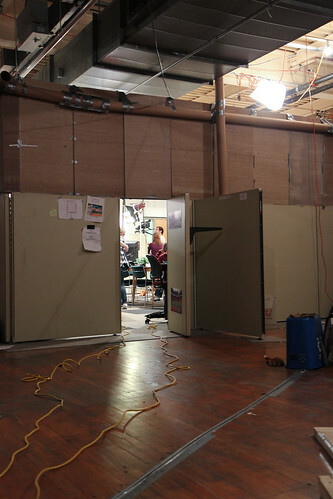 Before even unpacking their room at the start of their sophomore year, the production team headed over to South Hill to check out the 3,000 square foot space they were given permission to use for their set. For the first few weeks of classes, the crew spent countless hours building an entire newsroom from scratch with floors made with carpet squares, makeshift walls made of fiberglass ceiling panels, cubicles made with 100 pound pieces, props collected over the summer, and lighting equipment plugged into extra installed outlets. After putting together a complete production crew of 15 students and a cast of 10, the team started shooting every Thursday starting at 6 p.m. and ending as late as 2 a.m. Killeen and Breton would then spend many sleepless nights editing to meet the strict premiere deadline. Breton said the team works great together and has grown and learned immensely since the beginning. Over the past two seasons, Killeen and co-writer Sarah Kasulke have written over 180 pages of script. For season two, the writing team had to turn around 90 pages of script in one month. Despite the hours of hard work, the experience and final product is worth it, Killeen said. This will be the show’s last season. Killeen said they are extremely proud of what they have accomplished. Many were critical of their idea when they began, Breton said, and they have enjoyed proving them wrong.